When I was little I LOVED connect-the-dots pictures. It was like magic to see a thing or person take shape as I drew a line from 1-2-3. Ah! There was Casper the Ghost or a wishing well or Bambi! The key to unlocking the picture was a bit of knowledge—being able to read the numbers. Without an intellectual investment it was all random dots on a page. The result of my efforts was hardly great art but, for me, was rewarding in another way. I “got” what the creator of the page was trying to convey. This past weekend it was my joy to spend time in Washington DC with Evan. Steve and I drove down on Thursday and came home late yesterday afternoon. We got to see his new apartment on M Street, we ate wonderful food at an Ethiopian restaurant with him, we visited with our beloved, much-missed son—it felt like connecting the dots to reveal a picture of his whereabouts, his comings and goings these days. Evan, a wonderful host, asked what we’d like to do while in the capital. I heard that there was a production of Conference of the Birds at the Folger Shakespeare Library, based on a 12th century poem by the Sufi poet Attar, and was intrigued. 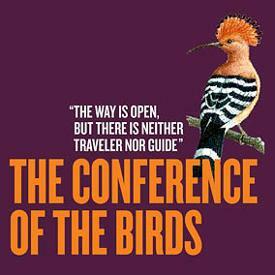 This poem depicts a journey of the birds in search of a king. Led by the Hoopoe, they traversed a desert and seven valleys to find the Simurgh, their monarch. The play was a journey of discovery for the audience as the feathered travelers moved forward, beset by trials and distractions. Together we sought enlightenment—who was this mysterious king? When would we arrive, and what would we find when we did? Dot by connected dot, we worked with the actors to create a picture: in the end, a mirror. The birds—and we—discovered that the king—that God—was one with us. At the National Gallery of Art currently, there is a major retrospective of the work of artist Roy Lichtenstein. Lichtenstein’s trademark was—dots. You’ve probably seen his work: comic book characters (with captions) writ large, myriad tiny dots of color making up the faces just as pictures are created in newspapers. But this exhibit also displayed other sides of Roy’s art: clever still lifes, serene Chinese-style landscapes. Almost always, dots were used to produce his artistic reality. We strolled through the galleries in wonder, viewing huge canvases splashed in primary colors juxtaposed with small, keenly observed pieces. All dotted manifestations of Lichtenstein’s genius. 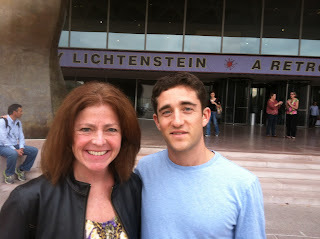 We returned home last evening, so so happy to have enjoyed this DC weekend with Evan. And as I resumed my Oreland life, I vowed to continue connecting the dots…the minute specks that make up our bodies, our surroundings, the tiny tiny things that, together, make up our vast universe. The dots that really link us all, if we take a moment to notice. We are part of all there is. And we are part of God. On our West VA mission trip--without this map we'd still be there! I've always had a lousy sense of direction. Even as a child, I remember getting lost on a three block walk to a friend's house. Whenever anyone asked me where my school was, for example, I drew a complete blank. Perhaps the other kids were paying attention as our intrepid driver careened through the neighborhoods in Bus 22 towards Our Lady of Perpetual Help. Not me--the bus could have sprung paddles and propelled us to London every day for all I noticed or cared. When I reached age 16 and got my license, I thought I might magically master the twist and turns that would lead me to my destinations. Alas, no. The map (remember roadmaps?) was my constant companion whenever I strayed from my habitual route to work--and forget about detours! I should have traveled with a bag of breadcrumbs, a la Hansel and Gretel, to mark my path. Inevitably, I'd pull into a gas station, hopelessly turned around, listen intently to the cashier's instructions--then take off again in the opposite direction from what had been recommended seconds before. Getting older, it’s gotten worse. 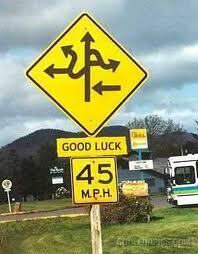 For some reason, even if I can get somewhere, I get all befuddled when it's time for the return trip. Nothing looks familiar, no landmark rings any kind of bell with me. I blame my chronic inattention to my surroundings. Don’t ask me the color of your carpet or the make of your vehicle—I haven’t a clue. My mom Joanie never drove, and gabbed her way through life in the passenger seat, Mrs. Oblivious. God help you if you asked her to find a location. She would look at you as if you’d just requested a short-cut to Jupiter. Luckily Mom never had to find her way out of a paper bag on her own. Among my offspring, Rose, PJ and Julie can navigate pretty well on the highways and byways. They can find IKEA without ending up at Walmart, even if they’ve only been there once before. Sheridan is spooky: for a non-driver he can lead anyone anywhere with 100% accuracy. But Evan is my Traveling Twin. He was born and raised in Oreland and still has trouble finding his way around. We thought it quite ironic that he was charged with driving a submarine in the Navy, and often pictured the boat heading the wrong way around the world with Ev at the helm. Steve is Directions King, hands down. He can accurately find a place he hasn’t driven to in 30 years. He NEVER gets lost. I find him very obnoxious. I worry that my directionless-ness has a parallel to my off-road existence. Am I drifting through the years without a clear sense of where I’m bound? Do I have a five-year, heck, a five-day plan for my future? Am I always asking for help, then roaring off the opposite way? Is it too late to learn to watch where I’m going on the complicated road of life? 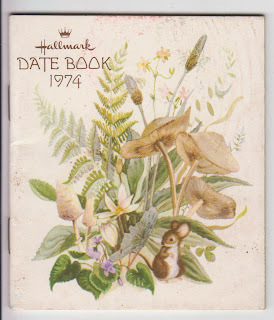 For a period of almost 30 years, I chronicled the details of our comings and goings in those little datebooks Hallmark tucks into the bag when you buy greeting cards. There wasn’t room to write much for each day, but I hit the highlights and as a result I can look up almost any Sunday-Saturday from 1974-2001 and tell you (if you care) what my family and I were up to. I kept these records religiously for so long that it is a real pity I gave up. We still keep a wall calendar in the kitchen, but these notations are spotty at best (PJ 3-5 w Z, Rose Dr. L. 2:40, buy coffee!!) and sometimes whole months go by and no one writes anything down. These are the months when we miss the birthday parties and book club meetings, because no one in the house can remember that well. A few weeks ago I was up in the attic and came upon a set of journals I wrote when Steve and I were on the road on our first children’s theatre tour of the Northeast, beginning in Ticonderoga NY in January of 1979.The days were busy, but the nights afforded enough time to scribble the tales of our shows and travels in minute detail. I was a regular Samuel Pepys, or his modern day equivalent, Ned Rorem! Alas, this stint in our lives, scintillating to us as it was at the time, would never crack the NYT bestseller list. When floods and fires and tornadoes strike, I watch TV footage of families who have lost everything, including their scrapbooks and diaries and calendars. The keenest memory cannot begin to recapture the full story of them—which is why you see folks sifting through the ruins desperately for any trace of their history, and why it is such a sad and poignant sight. Because it does matter. My time here matters to me. And I need some prompting to keep it all in mind. Going back to Hallmark this week. The 2013 calendars should be out. Some important things will happen next year, and I need to be ready.